In addition to fixing everyday image problems, such as exposure, red eye, and color saturation, most photo editors allow users to change the style of their photos, making them black and white or sepia or adding other effects. PostworkShop (free for Basic edition; $49 for Artist; $99 for Pro) expands the special effects features to offer endless possibilities to would-be artists. Place one or more than one style on top of a photo to change the look in PostworkShop. PostworkShop changes the look of a photo by layering styles--just as you would in Photoshop-- on top of the original image. They offer hundreds of different artistic styles, such as oil painting, pencil sketch, outline in marker, watercolor, colored pencil, and many, many more. Once you've laid a style on top of the image, the software will let you make adjustments, such as changing the opacity and changing the width or length of a brush stroke. But turning images into oil paintings is just the beginning, and Photoworkshop's layering framework makes the number of possible styles almost limitless. By layering multiple styles on top of each other and adjusting the look within each style and depending on what order you place each style, you can create a completely new artistic look to the image. Take advantage of the tutorials and videos in the software, however. Photoworkshop is a lot of fun and the creative possibilities are heady, but it can be frustrating to use. The mechanics are easy to learn, but working with layers is not always intuitive and getting your artistic vision on to the page means slogging through a lot of trial and error. I envisioned my close-up photo of a butterfly as a lovely watercolor, but it took more than applying the watercolor style to get what I wanted. Each time I applied a layer and another layer as I tried to achieve a certain look, I was disappointed. Still, it's quicker than taking an art class and after much adjusting, I was happy with the end result. The Basic edition is free to download and offers 50 built-in stock styles. 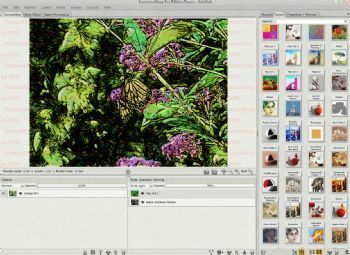 The Artist and Pro versions, which cost $49 and $99, respectively, both have a more robust interface and offer more than 350 stock styles. The Artist and Pro versions give you more flexibility in creating original works by blending the artistic styles available, and they allow you to save the styles you've created and share them with others.